Please Sign this Petition to Bring Alan Gross home. This morning I received an email from one of my favorite clients asking for my help. Right away, I called Marissa, whose home is on the market. Going right to the website, I read about Marissa's cousin, I watched Judy Gross, Alan's wife, interview with Andrea Mitchell and I listened to Evelyn Gross, a mother's plea to bring her son home. Then I signed the petition. It is time to do whatever it takes to get Alan released and returned to his loved ones. The family home had to be sold. His daughter and mother are both ill. There are 25,000 signatures needed by January 24, 2012. This is my favorite gift from a Best Friend. It is a very special book with twenty photos that chronicles our friendship over the past couple of decades. The front was done in my very special color..chocolate brown, and the opening photo was of Peg and me taken a few years ago. Slowly flipping through the book, good times and memories flooded in. Within moments I was on the phone turning each page and sharing those wonderful times with my friend Peg. There are photos of us at some of the many trips and excursions we did each month. A couple ActiveRain members. See if you can name them. There was Union Station in DC. The Fairgrounds at Timonium, The ACC art show that we went each and every year. There were pictures of CyberStars ™ and Floyd Wickman gatherings along with WCR and NAWBO and me at my Auction of Tatiana's Home. There are pictures of the day my book arrived and another of my first book signing. And lovely words through out. The cover title reads Best Friends and the book ends with...We are and will always be best friends. This is my favorite gift from my best friend. Spent some time with Cheryl Ritchie Wednesday evening playing with Skype...before we knew it...3 hours had passed. Ideas were coming at us fast and furious. What fun! I got to see Cheryl's Rag Doll collection and she got to see some of my porcelain artwork...along with figuring out how we were going to use Skype on the iPad. Home Inspection..to show buyers, who may not be present, or sellers to clarify a concern found. Easier to explain with all the parties "present". Buyers, when not together, and one is previewing a house. Settlement table. Bring out of town buyers/sellers to the closing where they can be seen signing and then faxing/scanning a needed signature. Skype INSTEAD of going to a meeting. Contract presentation. One agent with buyer, one agent with seller can speed up negotiations. Getting a price reduction...easier face to face. Final walk through can document any concerns. AR get together..have the iPads and Skype. Agent can preview homes, share with relo or out of town buyers to narrow the search. I am sure we will come up with a lot more! At the end of the calendar year, I like to change my advertising a bit. 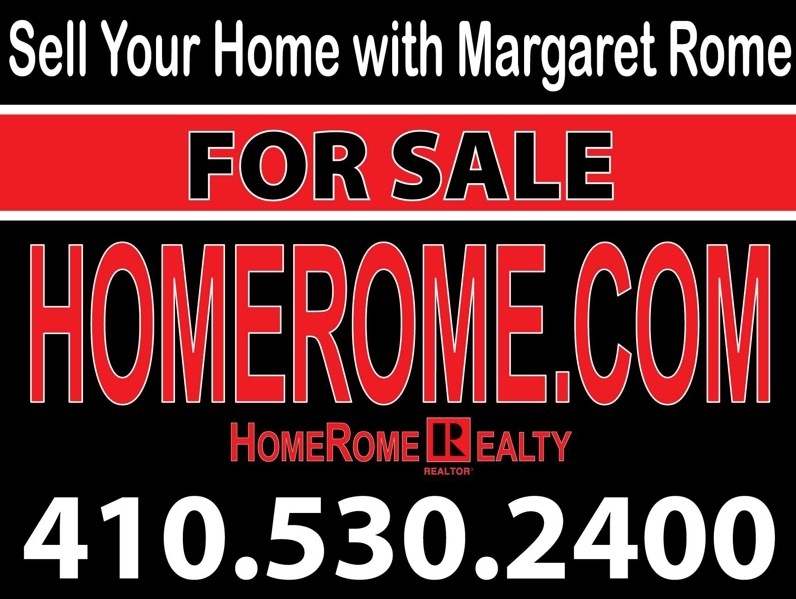 Sell Your Home With Margaret Rome has been a successful tag line for many years. I was thinking of doing an entire page with "SOLD" signs on all the houses... but then my current listings would not have the exposure. So I am using the top row with a banner that says IF YOU WANT SOLD ON YOUR HOME CALL MARGARET ROME. It is a subtle change that I will be using for the next two weeks. There is a Lot of Paperwork When Getting Ready to Sell! Anyone who has bought, sold, or refinanced a house in the past knows that there are stacks of papers that have to be signed before the keys change hands. Most of those papers come from the Realtor®, the title company, and the lender. When thinking of selling your home, you will need the necessary paperwork. Depending on how long you've been in your home these may not be so easy to find. Here are some of the items necessary to move forward with listing and selling. The documents when you bought the house - including the contract, the settlement sheet, loan documents, title insurance and location survey. Any documents from a refinance, ground rent or proof of redemption, home equity or second mortgage along with loan numbers and bank pay off information. 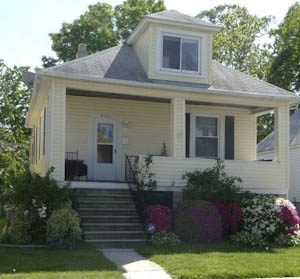 Receipts and permits for any major improvement or renovation such as adding a bathroom or extending a deck. Warranties for any appliances or home systems that you've repaired or replaced recently. Do you have a roofing certificate? Floor plans or original house plans, a list of what you love about the house along with out of season photos of the spring gardens, swimming pool or snow scenes etc. Homeowner association, condo, or co-op documents, including any proof showing compliance with the rules for renovations or additions such as decks or color changes. Tax receipts and bills that will show a prospective buyer the gas, electric, water, and tax charges. Power of Attorney,trustee and/or Death Certificates. Please have a couple of set of keys available along with the security code and garage door openers. Here is a two bedroom and two full bath fourth floor condominium in the luxurious Seven Slade Condo also known as Suburban Oaks. This spacious unit is conveniently located in the Pikesville area of Baltimore County zip code 21208. Eat in white kitchen has a separate door from the hallway entrance, pantry, double ovens, double stainless sinks, Maytag refrigerator and dishwasher. Entrance foyer, with walk in closet, has Parquet floors which run through the condo. These floors are mainly covered with wall to wall carpet. Master Bedroom (20'x12') has 3 closets including a walk-in and dressing area. The bathroom has a convenient stall shower equipped with grab bars. The second bedroom (15x11) has a large double closet and floor to ceiling windows...allowing views and brightness. Dining room area, measuring 13x10, is adjacent to the kitchen with a large bright window overlooking park like grounds. The second full bath with tub and shower also houses the stackable washer and dryer. How convenient...right in your own condo. The living room (24'x12) is large enough to have a combination living/dining room and then take the existing dining space for a den or family room right off the kitchen. Beautiful park like views from over sized windows and your own private balcony, can be enjoyed through the sliding glass doors from the living room. Watch the changing Baltimore seasons from each room. Your own control of heat and air conditioning ( utilities included in monthly condo fees)~ Swimming pool (water aerobics in the summer) ~4 guest rooms (for your out of town company)~ Library/exercise room (keep your mind and body in shape)~ Party room/social club (with kitchen for entertaining)and a storage locker. Beautifully designed and maintained lobby (notice the inviting shallow pool with fountain) . December’s Season of Celebrations & Sharing ...Big Smiles! And the Cake Was A Hit! Big Smiles! And the Cake Was A Hit! It was a very busy day last week..showing a listing in the morning and then shopping for just the right gift to take to our friend's Christmas party. I stopped in the Giant and found a perfect cake..just look and it is all cupcakes. Got into line and this nice lady invited me to go ahead of her since I only had one item. Then she realized she picked up a wrong item. I encouraged her to go back and I would watch her basket. As soon as she left..I unloaded her entire order onto the conveyor belt. What a nice feeling. After I left this store...only one more errand..a special gift for TLH. When I went to pay...uh oh..no credit cards, no money. My "wallet" was not in the Bag! Immediately called the Giant and they were so helpful. They searched the store especially around the isle where I did my shopping...no luck. I was about to call Lee to tell him to start canceling all the credit cards when my cell phone rang. It was a friendly voice and her name was Emily. It was a bad connection and I was trying to be patient. Then I heard her say a black band and cards. She found my "wallet". I was on the way back to the area. Emily and her friend Cindy waited for me with big smiles. A hug for each and some Christmas money which they both refused. Well I don't take no for an answer. If you don't want to buy a gift for yourselves then find the nearest charity and make a donation. Their smiles got even bigger...they liked the idea. Thank you Emily and Cindy! And by the way..the cake was a big hit at the party! December’s Season of Celebrations & Sharing ...Happy Christmas Eve ...Happy Birthday Gail Harris! Happy Christmas Eve...Happy Birthday Gail Harris! Gail is my friend and I want to wish her a Happy Birthday today! We met 10 years ago under extreme conditions at Johns Hopkins Hospital. Both Gail and TLH were very ill. Lee was given a poor chance of survival and Gail's diagnosis was not a whole lot better. We met at a catered poker game at the hospital that I threw for Lee. The guys were noisy and got yelled at by Gail's husband Rich. You see she had been in surgery all day and the poker party was disturbing. I felt so bad that the next morning I went into Gail's room waving a white napkin....asking for forgiveness. From that time we have been friends. I encouraged forced Gail to join ActiveRain. Just search our two names and you learn lots about the two of us. I have listed some of the posts below. Please go wish my friend a Happy Healthy Wonderful Birthday. She is one special lady. One of many stories about the PURPLE VISOR!! Half Million Points ...a True Group Effort! Feedback After a Property Showing! Thank You June! Feedback After a Property Showing! Thank You June. June and I met through one of the ActiveRain Meet-Ups and we have been together for a number of gatherings. She is an outstanding agent in Baltimore. It is difficult selling your home when you are many miles away. My sellers moved out of town after a job transfer. They love this home and did so many improvements to make it special. They were not planning on leaving for a long time. Hearing June's request to show this property..made my day. She also let me know there was a package left for the seller. And June went one step further. She sent me this feedback.
" Margaret, what a lovely home on Wentworth. My clients loved it but, it's just too small for them. The kitchen it gorgeous and my Mrs. absolutely loved it. My buyers would be in the same situation that your sellers are in now. I will definitely keep it in mind for other potential buyers though, it is just as cute as can be!!" Thank June for showing my listing, for the phone call and for the comment. I was able to share your kind words with my seller. Now this is feedback after a showing. Thanks to Bridget McGee for posting this to her special site. Click to see more information on Deerfield. 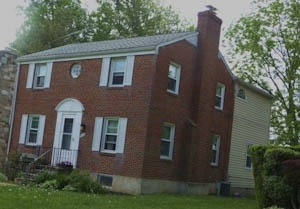 Enjoy this 4 bedroom Brick Colonial with 2 full and 2 half baths in Pikesville Colonial Village. It is in the heart of Pikesville, off the beaten track but close to transportation, light rail, shopping and within easy access to the Baltimore Beltway and downtown. This single familiy home has a huge two story addition. It has a great first floor bedroom/den, laundry and half bath. The second floor addition incorporates a beautiful master suite with a new luxury bathroom. There is a walk-in shower with custom tile work and double vanity. The bedroom is large and bright with big windows and TWO 5x5 walk-in closets. The remaining 2nd floor bedrooms share a nice full bath and double vanity. The bright eat-in kitchen has a breakfast bar, stainless appliances and a door to the porch that leads to the large, fenced yard. The separate dining and living rooms both have hardwood floors and are ready for entertaining or just cozying up in front of the wood burning fireplace. The walkout basement includes a finished clubroom has a half bath with easy to maintain laminate wood floors. This home has it all! For Pre-approval call Mortgage Mama at 410-960-2061! December’s Season of Celebrations & Sharing ...Baltimore's Miracle On 34th Street. Baltimore's Miracle On 34th Street. Who hasn't heard of Miracle on 34th Street? For over 60 years, Baltimore has had its own Thirty-Fourth street and each Christmas season, this Hampden neighborhood, is turned into a miracle of sorts. If you are in or near Baltimore, this is something not to be missed. If you are in or near Baltimore, this is something not to be missed. December’s Season of Celebrations & Sharing ..December Challenge Day 19..I Hope it Makes a Difference! These December Blogs have been boring to read for many members. So here is another take on this challenge. Karen Anne Stone wrote a post stating ''What if each of us could commit to find someone in need... and reach out... offer our hand in friendship, or do whatever small thing we could... to "lend a hand.. ?" This kind of challenge could really make a difference. So instead of telling you what I did productive today for the real estate business... I want to tell you the donation I made this week. Had not thought of sharing this because to me charity is not for talking about...it is for doing. But Karen made a good point. By sharing what we are doing it may encourage others do the same. So here is Day 19 and I hope it makes a difference. My friend Paul Tanenholz is President of the ML4 Foundation. Paul and Susan are the amazing parents of Lily, Heidi and Becky. They have been instrumental in getting this rare disease noticed. There are only a couple hundred known cases. Will this money help Lily...maybe not but it might help others in the prevention of ML 4. I am so proud of Lilly's dad Paul who heads up the foundation. Lily on the left..always smiling! Interested ....read about it and watch the videos. 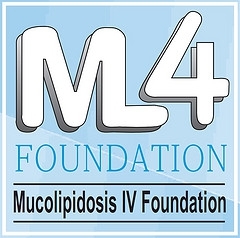 Here is the website for the ML4 Foundation There is a short 2 minute video and you can see a picture of Lily and Heidi Tanenholz. Just listen to Heidi talk about her twin sister. Should you want to learn more the 10 minute video is here. The Elmont is a luxury condominium and this one has Two Bedrooms and Two full baths. A joy to see.. in absolute move-in condition! 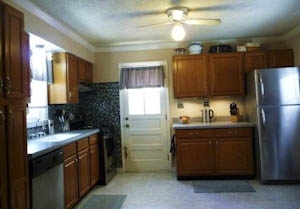 Take a look at the a new kitchen, new baths, new flooring and a ton of closet space! Beautiful views from this 5th floor location. This full service brick building, with reception desk, doorman and elegant lobby... sits back off of Park Heights Ave with the quiet feeling of a park. Located in the eruv with lots of lush landscaping and pretty views from the balcony and floor to ceiling windows. Oversized windows and sliding door to balcony. Beautiful NEW Eat In Kitchen! Convenient washer/dryer next to pantry. New floors, new cabinets, new counters! Lobby has new covered ramp for access. Master Bedroom with huge walk in closet. Second spacious bedroom used as a den.